Pristine white sand beaches are iconic to Hawaii, and the Big Island’s North Kohala Coast is home to some of the most stunningly unique beaches in the country. Scattered between the residential resort communities and charming small towns that predominate the area, there are plenty of glorious beach destinations perfect for any occasion, from a family day trip to an exotic sunset hike. The North Kohala Coast is home to some of the most stunningly unique beaches in the country, including Kauna’oa Beach, pictured here. Some Big Island buyers are surprised to learn there actually aren’t miles upon miles of white sand beaches on the island. The Island of Hawaii is actually less than one million years old and significantly younger compared to its neighboring islands, like Maui and Oahu. Because the island’s environment is relatively early in development, it has a greater geological variety of beaches. From black sand, crystal green sand, white sand, coral and even lava rock beaches, the Island of Hawaii offers an extraordinary array of beaches and beach parks that draw many buyers to purchase a home in one of the beautifully located Kona-Kohala coast resort communities. Punalu’u Beach is the Big Island’s famous black sand beach. In this prime location, the North Kohala Coast has more white powder sand beaches than any other part of the Big Island. 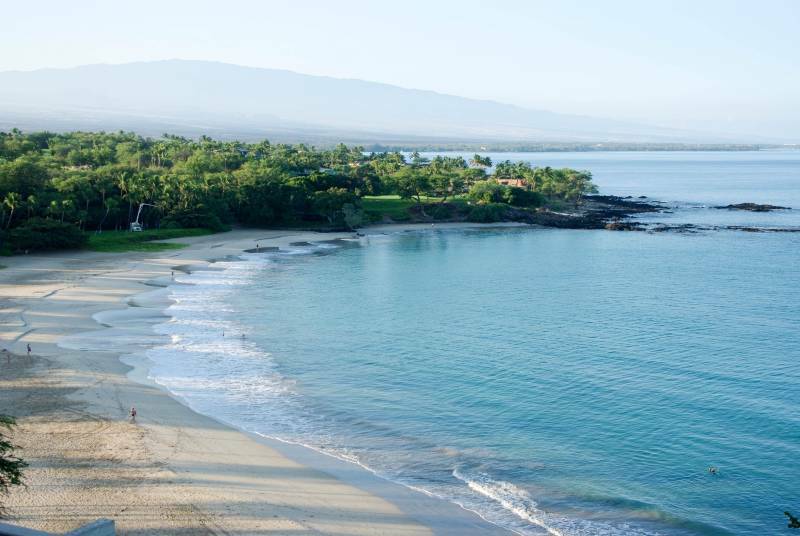 It also enjoys more hours of sunshine — it’s one of the driest parts of the island, receiving only 10 inches of rain annually — making the North Kohala Coast the ultimate locale to plan the perfect beach day and a highly desirable area for buyers and residents. Here’s a guide for Mauna Lani Resort community residents looking for an escape to their own sandy paradise, including some quiet, off-the-beaten-path beaches, water sport-friendly beaches, places that are perfect for family day trips, picnics, or exotic beaches to discover something unique. Waialea Bay Beach is a secluded white sand beach that’s somewhat off-the-beaten path, it’s also called Beach 69. There’s great snorkeling on the north and south side of the beach. Waialea Bay aka “Beach 69” is a secluded white sand beach perfect for swimming and snorkeling. 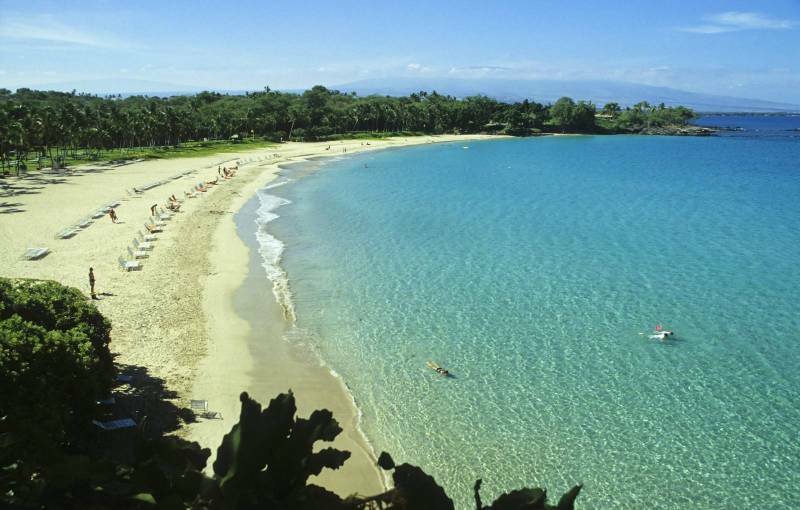 Hapuna Beach is a landmark white-sand beach that’s considered one of the most dazzling on the island, and in the world. It’s rated the 17th best beach in the United States for its picture perfect white sand and ideal conditions for swimming. 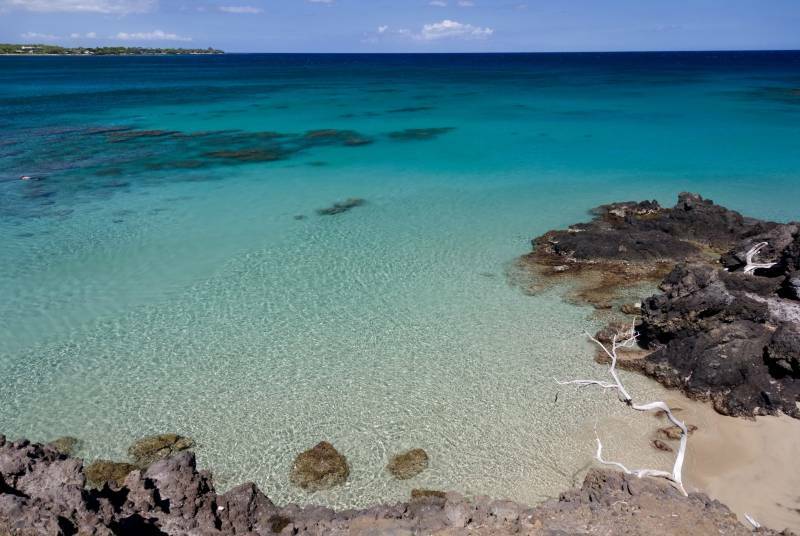 Located in Puako, a short drive from the bustling Mauna Lani Resort community, Hapuna is known for its glassy blue waters, white sand, and tide pools filled with marine life. It stretches a half mile and has excellent facilities, including ample parking, food vendors, picnic areas, restrooms, and showers. Hapuna Beach is one of the most popular white sand beaches on the Big Island of Hawaii. 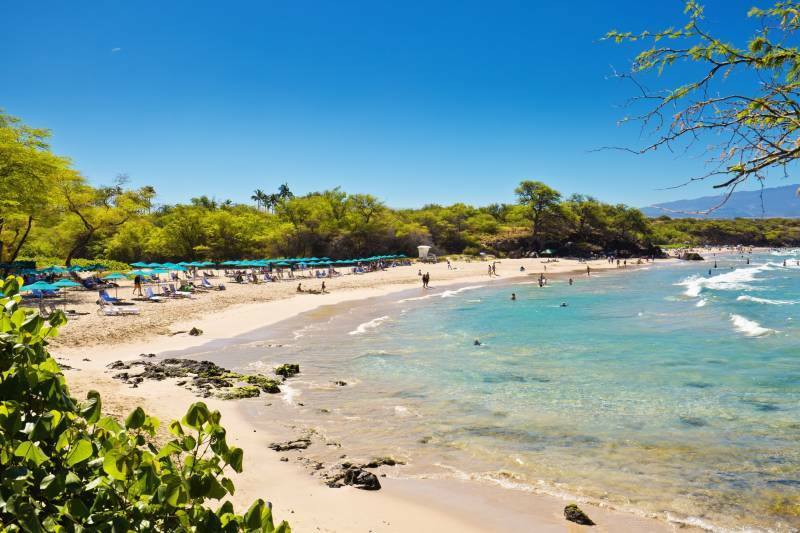 Kauna’oa Beach, also called Mauna Kea Beach, is the ultimate family-friendly place for everything from snorkeling, body surfing, and swimming. It’s a quarter mile crescent-shaped white sand beach in front of the Mauna Kea Beach hotel and one of the prettiest white sand beaches in Hawaii. At night, the Mauna Kea Beach Hotel turns floodlights on over the water to create a manta ray disco party. Plankton are attracted to the light, which attracts manta rays — large, harmless creatures that love checking out swimmers and divers. Learn more about the Manta Ray Night Dive. Kauna’oa Beach (Mauna Kea Beach) is a quarter mile crescent-shaped white sand beach in front of the Mauna Kea Beach hotel and one of the prettiest white sand beaches in Hawaii. 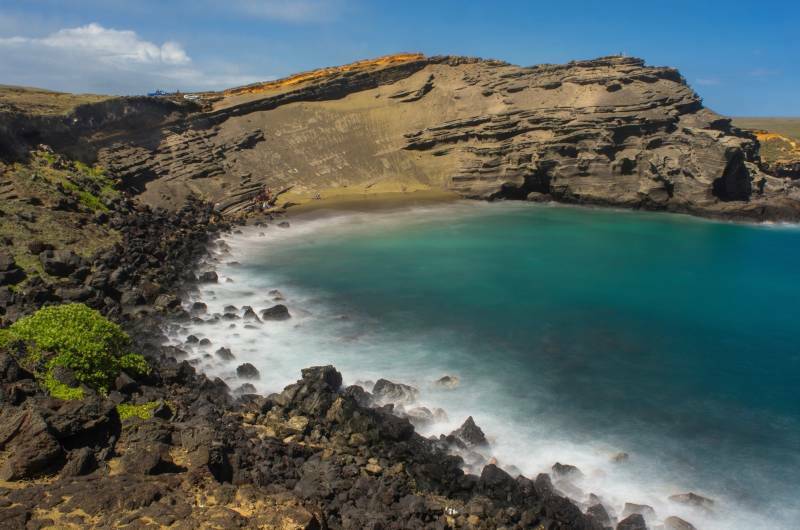 Papakolea is a secluded green sand beach on the southernmost tip of the Big Island between Kona and Volcano Village. It’s about a two-hour drive from Ke Kailani, but the incredible views are worth the drive. It’s actually one of only two green sand beaches in the United States, and it’s “sand” is made up of green glassy olivine crystals — also called Hawaiian diamonds — that washed out of a 49,000-year-old cinder cone on the east side of the bay. Papakolea is not easy to reach — it’s about a five mile hike round trip, including a moderate descent down a lava cliff on the west side of the bay — so be sure to pack plenty of water, food, and sunscreen. Papakolea is a green sand beach on the southernmost tip of the Big Island between Kona and Volcano Village. 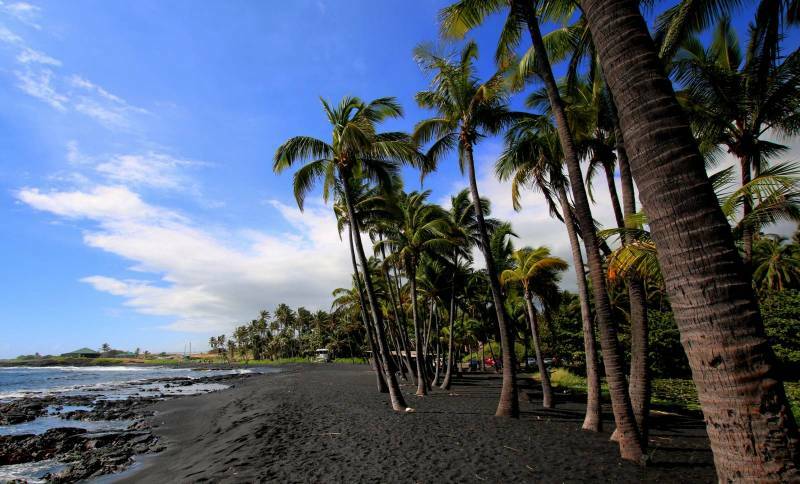 Punalu’u Beach is the infamous black sand beach on the Big Island of Hawaii that’s just over two hours from Ke Kailani. The black sand is actually tiny lava fragments that were created when hot lava entered the ocean. In the process, the lava instantly cools, solidifies and shatters, creating large amounts of black sand. 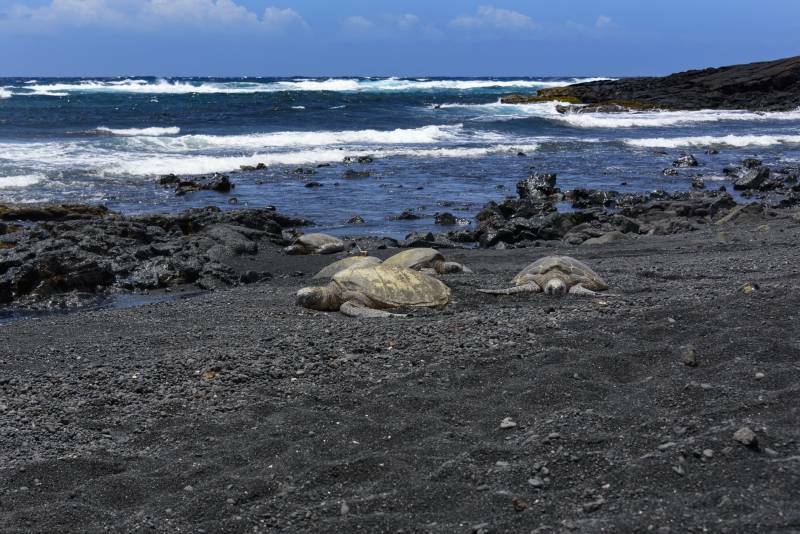 The black sand retains heat extremely well, which makes it a perfect nesting area for sea turtles, including the endangered Hawksbill and green turtles. Punalu’u is easy to access with nearby parking, but it’s not great for swimming or snorkeling, so snap a few photos on the exotic black sand. Sea turtles love the warm black sand at Punalu’u beach.